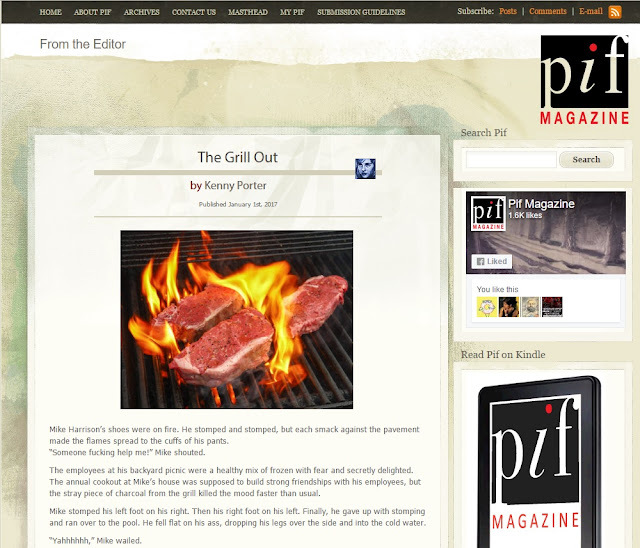 My short story "The Grill Out" has just been published by Pif Magazine! Read this piece of fiction for free and share your comments with me below. The Grill Out - Kenny Porter (Pif Magazine). Having a story published on the first day of 2017 feels great. I'm hoping to use this momentum to get more things published this year and to have more people read my work. Please feel free to share the story and to comment on the Pif Magazine page as well to let them know if you enjoyed it. The more people who share the story, the more it will help! Big thanks to my friend and editor Nikki for helping me edit and shape the story. I also have to thank my friends and family who read the piece and gave me critiques. And of course, thank you to the fine people at Pif Magazine for publishing my story.